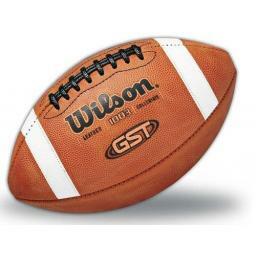 The F1003B: NCAA 1003 Wilson GST Football is both NCAA and NFHS approved. This football has 5 distinct features, the first is the WE Leather, which is exclusive Wilson Leather with deeper pebble and firmer texture.The second is the ACL Laces that are patented ACL (Accurate Control Lacing) made of pebbled composite leather, providing 174% more grip than traditional laces.The third is the Laid-In Stripes that are patented exclusive composite leather stripes that create 82% more grip than traditional painted stripes. The ball also features a new lining that is multi-layered for better shape and durability. Last, the ball bladder is 3-ply bladder for better air retention and moisture control. The Wilson GST Football also is official size, collegiate pattern, 863 premium GST WE leather, laid-in stripes, and NCAA and NFHS approved.